This is my first posting on this forum! I do use 4G myself, and *load balance* (not bond) it with my slow-ish 2.5Mbps ADSL connection. I'm not sure if true bonding is usually available for Fixed Line + 4G connections, as that has to be done at both the user's end plus the ISP end, as far as I know. So load balancing (+ "fail-over") seems the next best way of combining the 2 types of connections - the slower fixed line connection provides stability and unlimited data, and the 4G is useful for "turbo charging" for bursts of speed when you need it (plus v.useful backup connection). I live in rural Ceredigion (in West Wales), and unfortunately we've been left out of any BDUK upgrades (via "SuperFast Cymru" here) - and being on a long-ish EO (Exchange Only) line, options are few & far between. Also, being in a small hamlet (<= approx 30 premises), and sandwiched between villages that have been upgraded to FTTC, this has resulted in splitting the area into smaller fragments of slower broadband (usually <= 3Mbps, all on EO lines), making community schemes less viable. I'm still going to look into possible options: Openreach Community Fibre, FWA [Fixed Wireless Access via a local WISP], and TV Whitespace are the main possibilities I can think of, but with <= 30 households in play, and most providers needing at least 10 or 20 properties to sign up to make it viable, then as I mentioned, community schemes become a bit harder. Hence, the option of a 4G connection. I use a DrayTek Vigor 2860Vac router (with built-in ADSL/VDSL modem) as my main router, and a TP-Link Archer MR200 4G router with an EE Data SIM (32Gb currently, but now looking at the >= 100Gb per month data offers from Virgin / EE and testing Three coverage too), and the DrayTek has good options for load balancing these 2 connections, with plenty of scope for configuration which links to use for what (I haven't really got into it fully get). So, if as I understand things Weaver, you have several ADSL lines bonded together, you could add a 4G link load-balanced with that connection. You may even find that you could drop 1 (or 2) of your landlines eventually if all goes well, saving you money. I'm thinking of upgrading to the Huawei B525 4G router soon, as that's a Category 6 LTE router and, testing with a friend in the village who has one, gives a better connection than the TP-Link MR200. Also, I have a Poynting XPOL-A0001 omni-directional external 4G antenna that I may use, although I haven't really needed it as yet. But, in summary: I think a 4G connection is definitely worth adding into the mix if your only other current option is ADSL - well worth experimenting with at least. There are some good deals with EE or EE-based mobile networks at the moment (e.g. Virgin are doing 120Gb per month for £20 per month until 31 January - see: https://www.ispreview.co.uk/index.php/2019/01/virgin-mobile-uk-offers-120gb-data-4g-sim-plan-for-just-20.html - and Three do unlimited data for around £27 per month - but you have to look out for special offers every so often, e.g. "Black Friday" deals in November, and at other times too (I've seen Three with unlimited data [well, up to 1Tb - see other post in thread referencing ThinkBroadBand forum thread] for £20 per month, and Virgin Mobile [via EE's network] with 200Gb [or even 300Gb] for £20 per month). It's a good idea to get a decent 4G router, and order a few test Data SIMS (free from the mobile provider websites - Three give you 200Mb free data per month, which is plenty to test coverage and run speed tests, with other networks you may have to top-up with some credit to run speed tests, but even then you can still get a rough indication of signal strength from the router LED lights - remember to force router into 4G mode so that it doesn't fall back to 2G or 3G), so that you can test network coverage and speed in your area. 4G (at least via EE [=BT]) will have to be a suitable alternative to FTTC (with enough backhaul), as that's what BT/Openreach are proposing to use to cover the majority of USO (Universal Service Obligation) premises (see BT's response to Ofcom's USO consultation where they mention using their 4G FWA to cover the majority of premises, and also mention they will monitor & upgrade 4G capacity as & when needed - link to PDF file: https://www.ofcom.org.uk/__data/assets/pdf_file/0013/120361/BT.pdf). Good Luck anyway! It's definitely worth at least experimenting with 4G, I would say. EDIT: I forgot to mention, I get consistently over 10Mbps downstream & 1Mbps upstream via my 4G link, which is the minimum I'm looking for (based on proposed USO) - I usually get 15-30Mbps downstream and 3-15Mbps upstream (I'm expecting the Huawei B525 router will improve on this, testing over next 2-3 days). I have had downstream speeds up to 50Mbps on a few occasions! And using an external 4G antenna could improve speeds & consistency even further. I've just used the 4G router built-in antennae up until now (which have much better signal reception than any smartphone I've tried). A few links, while I think of them . . .
Huawei B618 4G LTE Router and basic specification. Huawei B525 4G LTE Router and basic specification. Thanks for adding those links, burakkucat, I should have really done that myself. Anyway - just to add an update, I've now borrowed my friend's Huawei B525 and tested it at home, and can say that it seems much better than my old TP-Link Archer MR200 - in fact, I can get a decent Three signal using the B525 router, with downstream speeds of 10-20Mbps and upstream of 5-10Mbps (that's only with brief testing, without scouring the house or attic for location with the best signal, and I haven't tried with external antenna yet). I can't get any signal at all using a Three SIM in the MR200. So - my recommendation for a decent stand-alone 4G router would be the Huawei B525. In fact, based on my testing tonight, I've ordered one (specifically, a Huawei B525s-65a, which has support for extra LTE bands) tonight from eBay. I'll look out now for special offers on Three SIMs (there's a rumour of the £20 per month unlimited data [well, 1Tb fair usage policy] being repeated soon, possibly tomorrow [Friday]), and hopefully use that as my final solution for boosting my broadband speeds (will load balance with ADSL - for now: I can understand why some people are starting to investigate using mobile broadband to actually replace their land lines, especially in areas like mine which are being completely bypassed for FTTC / FTTP). Anyway - apologies for the rambling post - but in summary: I would definitely encourage anyone interested, including Weaver, who can't get superfast speeds currently via ADSL (or even if they have slow VDSL), to at least investigate and experiment with 4G, ideally with a good 4G router: at the very least, it can be a very useful backup link in case of problems / outages with your landline service. Indeed, there is hope in a cell with such a low population density. Also I could bond it to DSL so that it could not be any slower than DSL, that would protect the minimum speed. I would need to work out how to get eg. the Mikrotik working, but I don’t think I have enough concentration with things as bad as they are. I wonder how good / bad it would be to run two 4G modems bonded. I would be contending with myself of course. However I would be taking twice the share of the cell and since my traffic would be halved per user that would halve my guilt and help guard against any throttling, plus even if the worst happened and I did get throttled it would be a (more than) 2x better minimum. AdamH, welcome to the forum, two very informative posts, keep us updated with how it goes especially if you get an external antenna. I would go for it Weaver, ignore my TBB comment for 2 reasons. 1 - It was based on Three's previous attempt at this "years ago". 2 - It was based on inner city performance, your location is very different, and Three issues seemed to be based on Cities not rural. Also everyone on TBB who has used it so far is happy. Plus I dont think you necessarily need an aerial either, I get great 4G in my bed etc. indoors. I am glad you finally considering this as I think it will be better than your current setup, I am amazed with long adsl lines you were at one point averaging less than one fault per year I consider that an extraordinary run of luck, my experience on a 50db loop loss ADSL service was a mess reliability wise. Things have changed because I realised that the AA L2TP thing should work and it’s affordable, now there is a cheap all-you-can-eat-eat deal and I’ve had a very bad period of unprecedented poor reliability. I need to find something that speaks PPPoE and the energy to do the work despite the pain. It seems however that the recent major replacement repairs done by OR instead of patch-up jobs have done the good thing,with unprecedented all-time high sync rate downstream of 3290kbps at ~3dB actual (6dB target) SNRM and all lines above 3M sync downstream giving 11.1M downstream figure from speedtest2.aa.net.uk, a record by miles. Why are you looking for PPP support? Any 4G router (assuming it has an ethernet port) should work fine - you just need an ipv4 connection to route your L2TP tunnel to A&A over (a few layers of NAT shouldn't affect it). No need for modems and PPP - you just give the Firebrick an address on your 4G router's LAN and use that for the outgoing L2TP tunnel. DaveC - good to know. I basically dint know what I’m talking about. I don’t know if the Firebrick will be as happy without PPP - don’t know enough about the bonding and up/down detection in the profile system. AA use PPP LCP pings to detect link up/down, and this might not be relevant. So I hear you. I will ask and find out what I am on about. But if I can find a good pppoe-speaking device then there’s no reason not to go for it. With a device that has an IP address, such as an IP router, I can get the Brick to detect link up/down state by ICMP pinging and that can control FB ‘profile’ state changes. But I’m not sure about it triggering rebalancing of load-splitting / bonding based on ICMP ping failures. I don’t know enough at all. The Solwise 4G IPv4 router that I already have would work at that level but it doesn’t have a wired Ethernet interface, only 2.4GHz 802.11n so that is a bit of a nuisance. It was meant for emergency portable use, eg hospital visits and has serious (but omni) antennae with it. I’m quite interested in a Mikrotik device. AA offered to give me some recommendations. If they would be willing to give me some support then that would be ideal, because, being so ill, concentration is in short supply much of the time. ICMP pings should work without PPP, without the additional overhead and processing. LCP echo works on IPoE? Also welcome Adam to the forum. And thank you for your extremely valuable contributions. It’s goodcto hear from someone who has ‘been there’ and is in a comparable situation yng Ngheredigion. Thanks for the welcome, Ronski & Weaver! I've just received my new Huawei 4G router today, and set it up in the best location for a Three signal (an upstairs window is usually the best bet for 4G reception, you may have to experiment using it in different locations to get the best signal), and am amazed that I'm getting a full 5 bars of signal on it (using the supplied "bunny ear" external antennae - was 4 bars with the internal antennae), on the Three network - I can't get any signal on Three in a smartphone or via my old TP-Link MR200 router. I've also ordered a Three Unlimited Data SIM (SIM-only) on the £20 per month deal, which lasts just for this weekend I believe. Note that I believe prices increase in May by January's RPI, but that won't be a lot extra on £20. I can definitely recommend the Huawei B525 router if you're looking to get into using 4G as a serious add-on to fixed line broadband: I'm not sure on the Kitz Forum rules for linking direct to sales items (e.g. on eBay), but if you search for "Huawei B525s-65a" via Google & select the "Shopping" category, you can find it on eBay, complete with the add-on antennae (which don't seem to be included with the same router on Amazon). The B525s-65a variant supports more LTE bands than the more common B525s-23a version, including the 700MHz band (I believe Three are investing in this band, although that could be for 5G in future), so go for that one if you can - otherwise, the B525s-23a is fine too. Anyway - I'm hoping that this 4G solution will finally provide those of us "out in the sticks" (e.g. Skye, Ceredigion, ... etc! ) with a useful boost to our internet links. The only possible downsides are contention from more people using it for the same thing reducing speed - but hopefully mobile networks will monitor and upgrade backhaul to cell masts over time, and in any case 4G (and eventually 5G - although probably not the latter in rural areas, for a few years at least). More people in rural "not-spot" locations seem to be cottoning-on to using 4G as an alternative, if they can get it. So - if you can get a Three signal in your area, I'd recommend taking advantage of the unlimited data SIM offer from Three this weekend. And then pair it with a Huawei B525 router (this has 4 RJ45 ethernet ports, a USB port, an RJ11 port for VOIP or "pass-through" handset [may be able to use minutes + texts on SIM too, I will experiment in time], plus SMA connectors for external antennae). As an aside, it's probably best to opt for the white model, as it may keep cooler on a windowsill location, I would think. I'll update the thread later on with my experiments & findings over the coming days & weeks. My plan is still to Load Balance the 4G connection with my 2.5Mbps ADSL2+ link, but if all goes to plan I can tweak it so that most traffic goes through WAN2 (i.e. the 4G link) via my DrayTek, with ADSL gradually being side-lined for other traffic (& failover). Good Luck to others who try this route too! 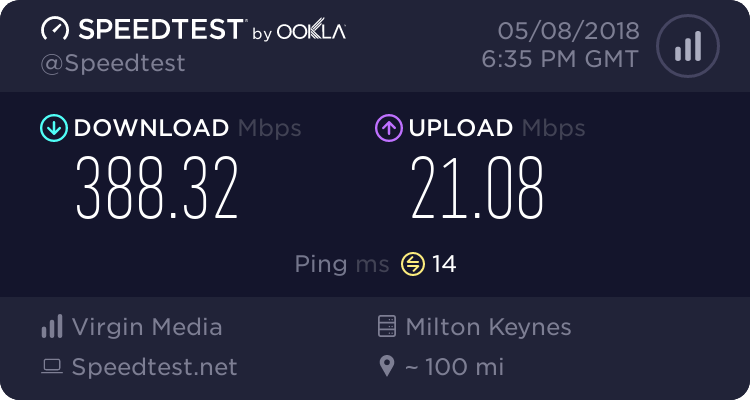 I'd highly recommend trying 3G/4G, perhaps in addition to a 'normal' broadband connection. We live about a mile from the local town and had been stuck with poor (ECI-based) VDSL, with 10M download and a meagre 0.5M upload - but some of my kids wanted to do online gaming, which would be impossible with that setup (as anyone just sending an email with a photo would have literally 'killed them' mid-game). So a few years ago I put a Huawei B593s-22 in the loft and got a good 4 bar (out of 5) 4G signal from EE. I got my Draytek 2860 to divert their connection to the 4G modem, whilst everyone else's went via VDSL. The SIM only had 64GB per month, which was just about enough for their gaming use. More recently (6 months ago), I put a Three all-you-can-eat SIM into the Huawei and added a directional LTE antenna (Poynting 4G-XPOL-A0002 from Amazon) in the loft (the roof is tiled with slate). I needed the antenna so that I could choose which Three mast I was connecting to, as I had two locally: the closer one was right near a load of houses and the download rate would often drop below 4Mbps (although upload was always around 30Mbps); and the other was further away but by a motorway and always had excellent up & download speeds (30Mbps for both). Both gave 3 to 4 bars, but that bore no relation to the data throughput! Technically I should only use a mobile phone with that SIM, but I'll only be doing this for another few months whilst FTTPoD gets installed - all paid for and currently waiting for some more BT survey work to do with the ducting. So, yes, get a Huawei modem/router. Mine had built-in WiFi but I rarely used it - but if your house isn't too big it may be all you need. The pertinent quote from that article is: "withdrawn restrictions on the use of handset SIMs in dongles and mifis" ("handset" refers to "phones", and "dongles and mifis" are taken to include "4G Routers"). So - you are within your rights to use any SIM card in a 4G router! So, don't worry about doing that! Given the speeds I get on my phone sat it bed, which have reached 100/30 it's tempting to do away with VM and change to three, would save £276 a year. With a proper 4G modem it can only be better, I'll have to see what the speeds are like in the evening as we live in a built up area. ETA Actually this maybe a non starter as there appears to be issues with public IP addresses and Nat.